Being a clown is fun; putting on makeup is not. When your job is to entertain people, or scare people, it seems pretty pointless to waste time on your vanity. Making up your face with bright-colored paints is just not the way you want to spend your valuable time. 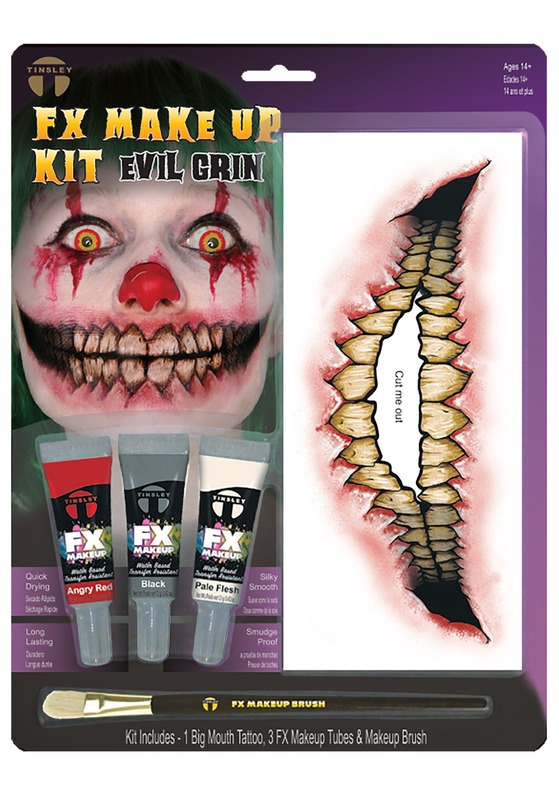 You rather be practicing your juggling routine or tending to your balloon animals and we totally get that, that's why we are introducing you to this handy evil clown FX tattoo kit. You can spend more time dabbling in your clown duties because this kit will save you plenty of time. This temporary tattoo will give you an evil grin with mouth full of sharp jagged teeth. Add details to the rest of your face with the makeup and brush. You will have an eerie clown face in no time so you can spend the majority of your day doing scary clown activities, like creep through the woods or stand outside someone's window!